Viva La Vegan! - Why vegan? There are many reasons why someone would choose to become a vegan. I decided to become a vegan just after I finished high school when I realised the dairy products and eggs that I was consuming every now and then were causing just as much, if not more, suffering for my animal friends. I had become a vegetarian two years previously when I made the conscious realisation between the life that once existed and the lamb's leg I was about to eat. I had no idea about the abhorrent treatments of chickens to get their eggs and cows to get their milk, but once I was aware of it, I became a vegan as I didn't want to participate in the cruelty, abuse or death of any of the beings on this earth. Vegans aim to do their part to end the suffering, cruelty and exploitation of all forms of animals by choosing not to use animal products or by-products for food, clothing and other purposes. The word vegan was invented by Donald Watson in the 1940s but the term hasn't been widely used in the mainstream public until the last decade. Vegans are strict vegetarians who choose to not eat animal flesh of any kind (including chickens and sea creatures), animal products (including eggs, dairy and honey) and by-products (including gelatine) as well as not wearing animal skins and animal products (leather, silk, wool etc). Veganism is not about rules and regulations, it's not about constraints and fanaticism. It's about doing your part the best way you can to cause the least amount of suffering in this world. My main reason for adopting the vegan way of life is that I believe that we should not use, kill or cause suffering to any (non-human) animals when there are alternatives available. I believe in using our resources, whether it be material or mental, to create a positive environment for all of the creatures on earth. We are not like the non-human animals who kill in order to survive, as we have the ability to reason and act from a conscious level. The difference between a vegan and a vegetarian is that a vegetarian consumes animal products, such as eggs and dairy, whereas a vegan does not. However since the 1970s the term vegetarian has been so lost in the translation that some vegetarians choose to eat animal flesh as well as animal products. There are so many benefits to being a vegan. To be able to look each non-human animal in the eye and know that they trust me is a very powerful and humbling experience. The advantage of feeling, being and actually looking healthy cannot be expressed fully in words. To know that you are doing your best to not contribute to any suffering of any other kindred spirit on this earth is a wonderful thought and you feel connected to all beings. There are so many alternatives now to animal products that I find it laughable when people say that it's too hard to become a vegan. Humans are very adaptable creatures and we change to fit our environment. When I first became a vegan in 1997 it was quite difficult to find vegan products and it was hard for me to give up chocolate and ice cream, but my reasons for doing so surpassed my cravings. There are so many supermarkets, locally owned stores as well as health food stores, markets and the vast amount of vegan websites available now! There are many great quality alternatives to all animal products available, just do your research. If you are not educated, become educated. It is necessary to ensure that you are getting all your nutritional needs from a variety of fresh produce and whole grains. Be aware that you may need to get your sources of protein, iron, calcium, vitamin B12 (just to name a few) from alternative sources than where you may have used to. Experiment with your cooking. Frequent Chinese, Indian and other stores that cater predominately to another culture than yours. This will open up the variety of foods that you consume so that you never become bored with your diet. Buy fresh, organic produce as much as you can and support locally owned, family-run businesses. Think locally to act globally. If you are compassionate, be compassionate. If not, then learn. Healing of the self comes from healing others and vice versa. If you do not contribute to any suffering towards any being on this earth, then you are contributing to the healing of the universe. Change your belief systems to change the world. Respect yourself and each other. Lead by example. Let your passions inspire all who come into your contact. Surround yourself with positive people who are one the same life path as you, who dare to dream and aim to achieve. Take responsibility for all your actions and live your truths. 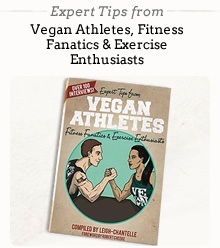 information © Leigh-Chantelle & Viva la Vegan!